Wyclef Jean Officially endorsed Michel 'Sweet Micky' Martelly in his bid to become the next president of Haiti in a press conference yesterday. Here is a photo of Micky and Wyclef shaking hands at the press conference. Also check out a VIDEO of Micky & Wyclef Campaigning At SOB's - Mirlande Manigat Can't Touch This! 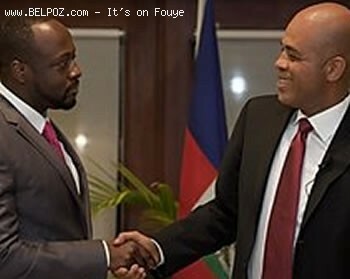 Why did Wyclef endorse Michel Martelly for president you ask? According to AP, Wyclef said that he decided to endorse his longtime friend because he's technologically savvy and has a charismatic personality that will "help raise money with the donors." "My endorsement is not based on the fact he's just my friend. That would have been an emotional thing"
... I think Martelly represents real change." What is your opinion about Wyclef's Endorsment of Sweet Micky for president of Haiti? Do you think he us just endorsing his friend or is it more than that? Killwhitebabies, we can hear you screaming for help. Get some help quick, before it's too late. Call a priest or call an ambulance for yourself. I do consider my self at the forefront of the Haitian experience in﻿ the 21st century( away from home in foreign countries yet still carry﻿ the the original pulse of my people). So needless to say, its beyond unbelievable to see how parasitic forces of the U.S. Fance and others are so hell bent on completely destroying my people with their propped up puppet leaders and relentless manipulation. moin dako ke nan poin you moun ki ka sove ayiti, ni moin, ni wou, ni mirlande e ni michel. Se seul Gran Met Leternel ki ka soven e kika aiden. Min pouli aiden, fok nou aide tet nou tou. Fai yon jen pouw aide au lie de cache deye ecran saa ap voye roch sou moun kap sache aide. Micky ap sache aide, ou min wap voye roch. Bib ou enba bra goch, roch ou nan mim drote. To you Miejo, and all the other Sisters and Brothers i have had the pleasure of sharing some words with. Luv U all!